Millions of people throughout the world have memories of traipsing around the world, usually during their younger years. They explore different countries, cultures, and lifestyles while moving from land to land, often on a shoestring budget. Many of these travelers have found hostels to be the easiest way to travel. Hostels vary widely, both in quality and price, but in general, offer travelers an inexpensive and safe way to spend the night in the various locations that they visit. Ascent Institute is an educational facility which offers hostel accommodations to the young Jewish people who come to visit Tzfat and explore Judaism. Ascent has been on the Tzfat landscape since the early 1980s, as a friendly and welcoming beacon to the thousands of people who have passed through its doors, looking for a deeper connection and more intimate understanding of Judaism. The rooms at Ascent are clean and comfortable. They are set up dorm-style, with a men's wing and a women's wing. There are bathrooms and showers for each room, and the hostel is set up in a manner which allows guests to enjoy meeting other guests and the Ascent staff for discussions, classes, Shabbat hospitality, or just to sit and "shoot the breeze". The Lifshitz Hostel is located in an old Arab-style house, with domed ceilings and stone walls. Each room has 6 beds, and there are 2 rooms, one for men and one for women. The facilities at the Lifshitz hostel are quite basic, but everything is clean and orderly. Few people have stayed in Tzfat for long without seeing Shoshana, a friendly lady who walks the path between the bus station and her house with a stroller to support her aging frame. Shoshana visits the bus station daily to meet visitors who might need accommodations for the night. She wants to be sure that no one is left without a place for the night, and she spends much of her free time talking to people to make sure that they are enjoying their visit. 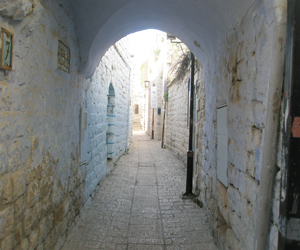 Shoshana's hostel is located next to the Lifshitz hostel, on the lane below Palmach Street in the Artists Quarter. It is a simple room with clean beds and bathroom and shower facilities. There are no amenities at the Shoshana Hostel - it is a true backpacker's hostel for those who want an inexpensive hostel bed. But a night at Shoshana's comes with some of the best company in Tzfat - Shoshana! And that's why Shoshana enjoys return company every year. To contact Shoshana, phone 972-54-5970-467.